What do other members of Team Loodens say about Erik? How people learn new skills and develop as a person is what fascinates Erik. He has applied these lessons in his own athletic career and is now applying them in the way we have conversations. 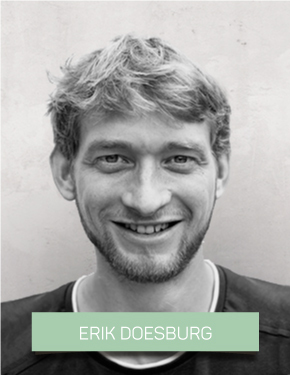 Erik brings daily insights from researchers to Team Loodens and supports the structure of our courses. He brings the trust that what our gut tells us is helpful, and translates our insights into easily digestible concepts for our learners. So they can reinvent conversations in their own life. What do people say you are good at helping them with? I keep people focused on the task at hand and the goal they are working towards. People say I am in-tune and present. I seek understanding and clarity and speak up when I don’t understand what I am hearing. I am honest and really care about what is going on for other people. These qualities help people feel comfortable to process challenging situations and move forward with peace and clarity. What perspectives do you bring? I come with perspectives of an Industrial Engineering and Management Master Student, an Expat, an ultimate frisbee player, an amateur elite athlete, a son, the second of four siblings, a house-mate, a team captain, a frisbee coach, a meditator, and a reader. Is there anything you feel uncomfortable about in sharing this work? I came to this practice of needs based communication because I wanted more depth and connection in relationships. I have learned many things but am still a yellow belt in this skill set, not a black belt. Nonetheless, I am excited to support others who are not as far along as I in this journey. What qualities would you like to have more of in a year from now? I would like to understand what’s going on for me more quickly and verbalize it. I am practicing the skills of checking for understanding and requesting a reflection when I want to be sure someone is understanding me. What is one of your favorite questions to Reinvent Conversations?